A few weeks ago we had the pleasure to sit down with Chef Linton Hopkins who is the Executive Chef/Owner of Restaurant Eugene in Atlanta, Georgia. 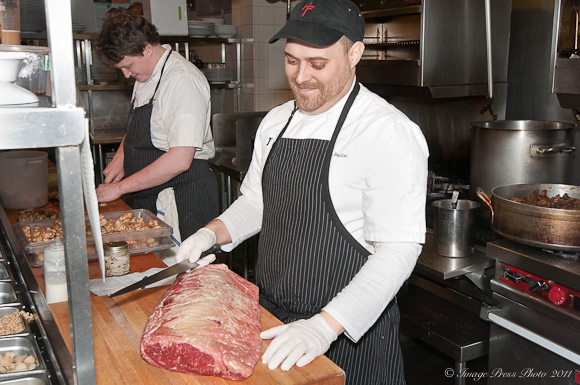 Chef Hopkins was nominated for the James Beard Award for the Best Chef in the Southeast 2010. He was also one of Food and Wine’s Best New Chefs in 2009. Hopkins has appeared on Food Network’s Iron Chef challenging Masaharu Morimoto to a battle in 2007. 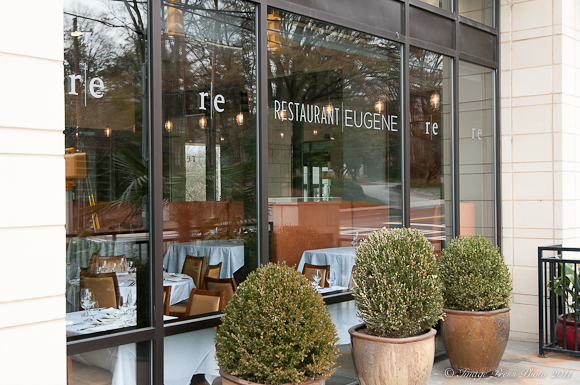 Restaurant Eugene was listed as one of the Top 40 Restaurants in the U.S. in 2011 (Gayot). 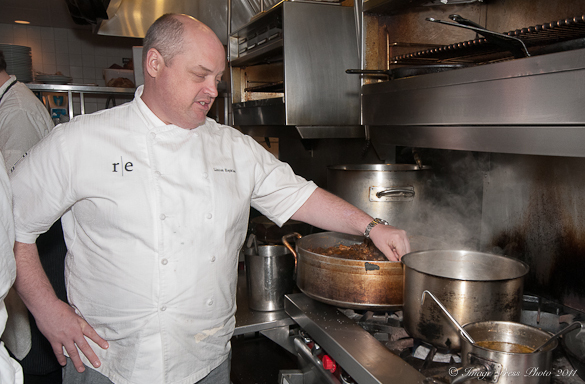 There have been many other articles written about Chef Hopkins and awards given to Restaurant Eugene that you can read about here. 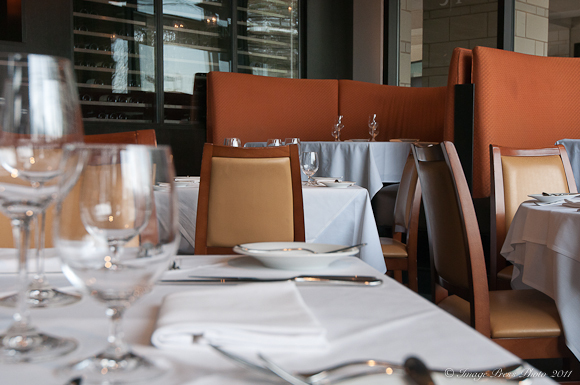 Restaurant Eugene is one of the few fine dining establishments left in the city of Atlanta. Atlanta has seen the loss of several of its great restaurants and chefs over the past few years with the closing of Seeger’s, Joël and The Dining Room at The Ritz-Carlton, Buckhead. With the many accolades and articles written about this chef, The Bunkycooks wanted to take a different approach and understand what ignites the passion in this man and the events that have shaped his philosophy of food and life. 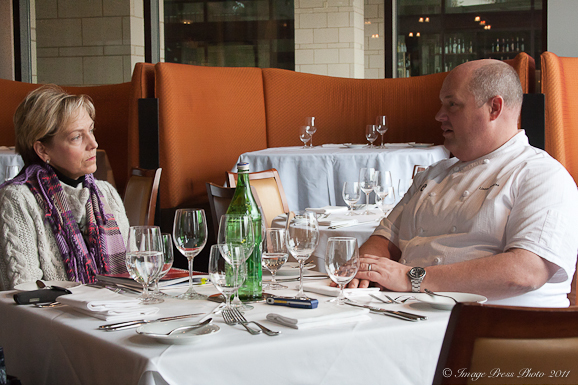 When we arrived at Restaurant Eugene to meet with Chef Hopkins, he was sitting down with one of his local farmers. Hopkins, who supports many of the local farmers and artisans is committed to serving at least eighty percent local foods at Restaurant Eugene and his other restaurant, Holeman & Finch. In fact, most everything is house made at these establishments, including such basics as mayonnaise, mustard, ketchup and hot sauce. They also cure and age their own meats, preserve the season’s best garlic and other fruits and vegetables, prepare homemade pickles and preserve oranges. His commitment to support local farmers and a sense of responsibility to the community is exemplified by Hopkins’ involvement in the preservation of Southern foods and traditions. 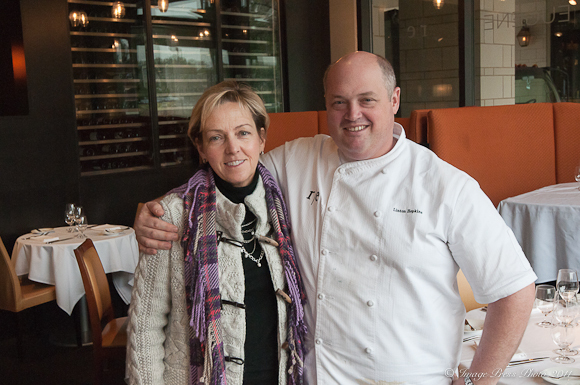 Chef Hopkins is President of the Southern Foodways Alliance, Gina (his wife and business partner) is President of Georgia Organics and they are both co-founders of the Peachtree Road Farmers’ Market, which was started in 2007. They are also involved in the Southern Food and Beverage Museum (Chef Hopkins is on the Chef’s Advisory Board) and on the Founder’s Council of the Atlanta Food and Wine Festival, with its inaugural event taking place May 2011. Hopkins, whose family roots in Atlanta date back to pre-Civil War times, is committed to the city and to preserving that sense of community for his children. I would describe this man’s passion as creating family, not only for his own family but also for his extended family of the community surrounding his restaurants. Why has this become so important to this man? Once a pre-med student at Emory University, Hopkins changed his career path after finishing his undergraduate degree and went on to attend the Culinary Institute of America (CIA) in New York. He decided that he could make a living doing something he loved (cooking), as influenced by his family experiences around food as a child, rather than pursuing the same career his father did to become a physician. After graduating in 1993, he moved to New Orleans where he worked for the Brennan family at Mr. B’s Bistro. He said it was this experience that really taught him so much more than cooking. He learned about “multi-generational hospitality” and it has really impacted his thinking about his own business over the years. From Mr. B’s, he moved to The Grill Room at The Windsor Court Hotel in New Orleans and then to Washington, DC where he worked at DC Coast. It was here that he met his wife Gina (a Sommelier and now Operations Manager for Restaurant Eugene). They moved back to Atlanta in 2002 and opened Restaurant Eugene in 2004. Hopkins, who is a cancer survivor (he was diagnosed with Hodgkin’s disease at age 29) said that going through that experience and having been through chemotherapy definitely put him in a different place in life. He said that he is not sure if he would have met and married his wife or opened his own restaurant had it not been for that life changing experience. As a city, Atlanta really struggles with its identity and as Chef Hopkins says, it seems to almost change that identify every five years and many of the restaurants change style and focus along with it. Many of the well known chefs in Atlanta have moved away from their white-tablecloth restaurants and have opened high-end burger spots (like Richard Blais and Shaun Doty). Restaurant Eugene is a personal passion for Hopkins linked to the food as well as his grandfather for whom the restaurant is named. He operates several other businesses, Holeman & Finch, H&F Bread Company (one of the few artisinal bread makers in Atlanta) and H & F Bottle Shop to support and buffer Restaurant Eugene from difficult economic conditions or changes in the Atlanta palate. It is important to him to provide a restaurant in his community that prepares the best of local fare despite the dramatic changes in the Atlanta restaurant scene over the past few years. High quality locally grown foods tend to be more expensive. The smaller farmers are not subsidized nor do they have many of the benefits of large farms. Therefore, they have to charge more. Hopkins says that people often complain at the Farmers’ Market about the cost of the produce and foods available. 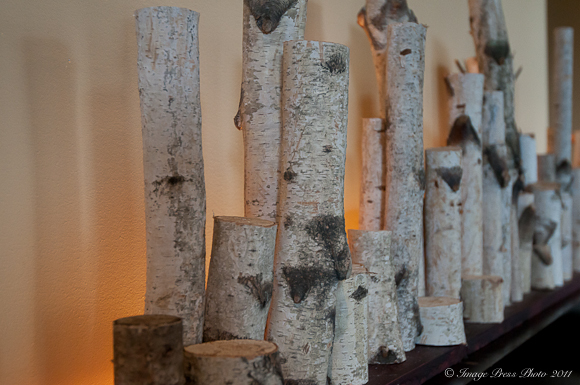 This is also the situation when creating a menu with more than eighty percent locally grown foods. It certainly translates into the prices at the restaurant. The other challenge for a restaurant that uses fresh and local ingredients is that the menu changes frequently. Their Chef of the Garden will go to the Farmer’s Market to hand select what looks best. He prefers hand selecting at market rather than having the purveyors deliver the produce. When chefs change the menu based on the best available ingredients, mastering consistency can be a challenge. People want to have a great experience every time. The Executive Chef shouldn’t have to be at the restaurant for someone to have a great meal. Excellence should be all across the board. Hopkins says the most important tool to gaining this consistency is team building. He keeps the chefs at the same stations for longer periods of time doing the same things. You need a system of excellence to keep the level of consistency, especially when everything is made from scratch. 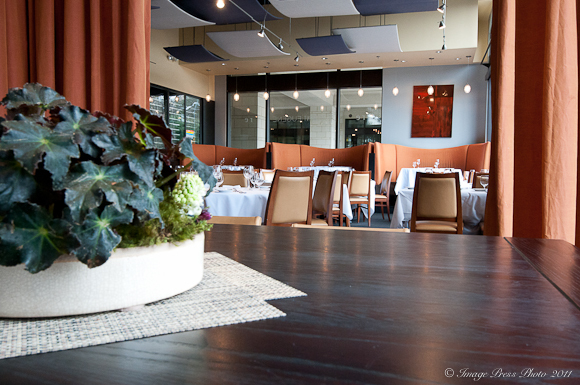 Hopkins is committed to having a restaurant that is “relevant and meaningful. It is about sitting down and having a meal with family and a real conversation, “even if it does take one and a half hours. It is about the conversation and the celebration of food”. He said that many people rush in and have somewhere else to go after dinner, rather than spending an evening over a meal. As such, they don’t experience the sense of community that the table offers. When asked how he feels about some of the newer food critics reviewing restaurants, Chef Hopkins says that he misses the way that Gourmet magazine used to write about food with integrity and not sensationalism. “Gourmet was responsible and wrote about the importance of the food and wine culture, rather than celebrating junk food.” As he says, our society has become very cynical and critical. When he dines out, he will go to a restaurant looking for the positives rather than the negatives. What is great about the place? Was their service good? Do we like the bartender? On the whole, we as a society tend to look for all the things we didn’t like rather than what we did enjoy. 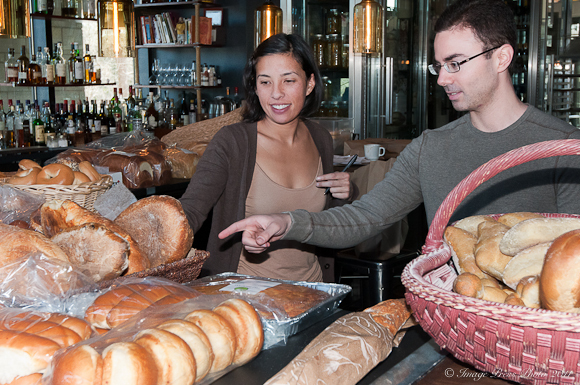 You can purchase H&F Breads at Holeman and Finch on Saturday mornings. In our conversation, Hopkins asked the question, “What is Atlanta food”? That is certainly a good question. When we think of cities like Boston, we think of clam chowder and great seafood. We associate New York City with a fusion of the best International flavors. Great steaks come to mind when you mention Chicago and seafood and Dim Sum in San Francisco. In Atlanta, where we tend to look at some of the private clubs as the better dining options, Hopkins is desperately trying to change that and create a place and a cuisine that Atlanta can be known for. Most importantly, Chef Hopkins is committed to the community, supporting local farmers and producers, preserving the heritage of Southern foods and is he focused on the importance of family. I appreciate the time that Chef Hopkins took with us to sit down and have a real conversation about about life and his food and what matters most to him. It was a real pleasure. 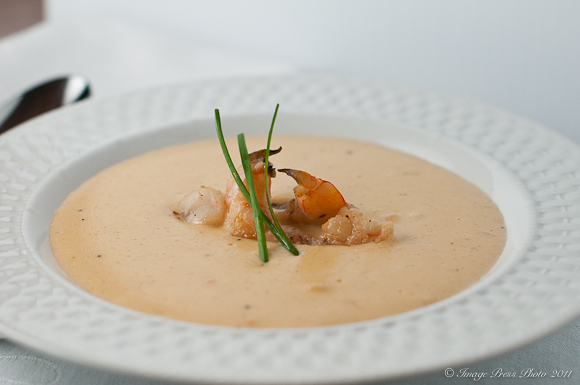 He has been kind enough to share his recipe for Shrimp Bisque from Restaurant Eugene to publish on Bunkycooks. This is a delightful recipe. There are several steps, but you will find this soup to be well worth the investment of the time it takes to prepare it. It is a perfect soup to serve for a special occasion. 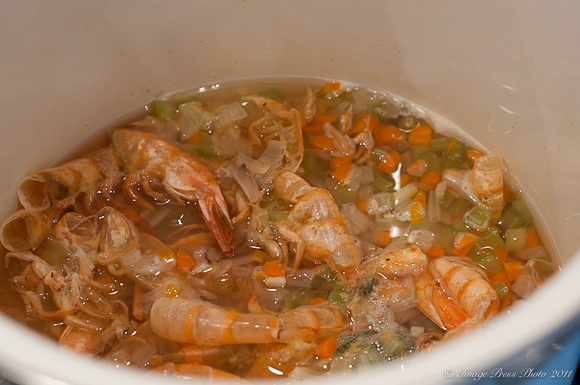 You will need to make homemade Shrimp Stock to prepare the Shrimp Bisque. Carolina Gold Rice is one of the ingredients in the Shrimp Bisque. I did have to order the Carolina Gold Rice from Anson Mills, but you should be able to find the other ingredients locally. Chef Hopkins’ philosophy is to cook with the best of the local and simple ingredients and this Shrimp Bisque is a perfect example of that type of dish for those of us in the South. Heat butter in a large, thick bottomed pot until it just foams. Add onions, celery, fennel and bell pepper and stir to coat. Sweat the vegetables until they soften and begin to release their juices. Add garlic and sachet (parsley stems, peppercorns, bay leaves and coriander seeds, wrapped in cheesecloth) and cook 1 minute. Bring up heat to high and add the crushed tomato and cayenne, let cook 1 minute, stirring vigorously. Add sherry, a pinch of salt and cook on high until sherry is reduced. Add stock and bring to a boil. 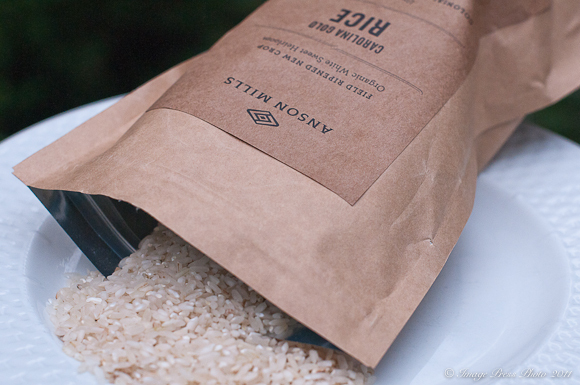 Add rice and bring to a boil, reduce heat and simmer for 10 minutes, until the rice begins to fall apart. Remove sachet and blend in a blender until smooth. Pass through a fine chinois into the pot, bring back up to a simmer and add heavy cream. Turn off heat and whisk in shrimp butter. Adjust seasoning with salt and lemon juice. Serve with sherry. Wonderful interview, pictures and recipes. Thanks for sharing. 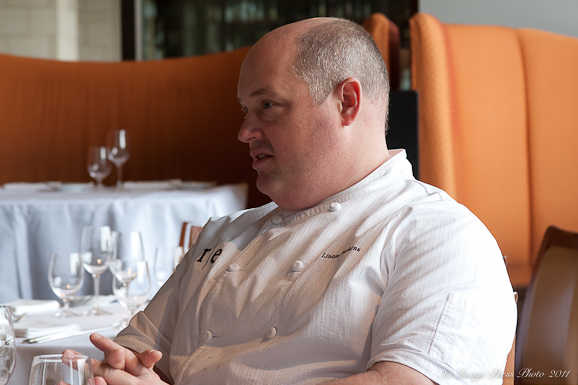 Chef Hopkins is a reminder of the positive and exciting things happening in ATL. Another wonderful profile, Gwen! 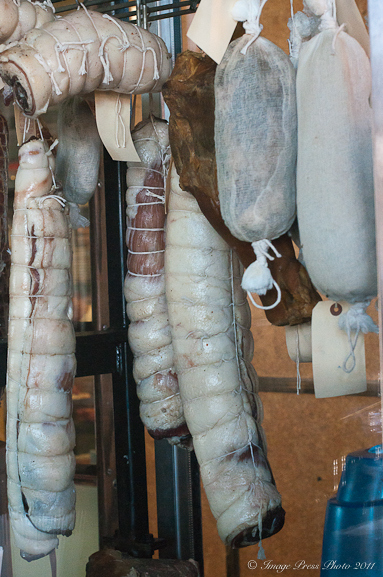 I love learning about all of these restaurants/farmers/butchers through your posts. Even if I never get to any of these places, I feel like I’m there. wonderful interview, i enjoy reading about new chefs, Chef Hopkins clearly has a passion for life and his food..thanks for sharing..tweeted! What a terrific interview – you really rock at these cover stories! And when I saw those shrimp shells in the broth, my knees buckled! I love it Gwen 🙂 And lovely pics as usual – you look great!!! 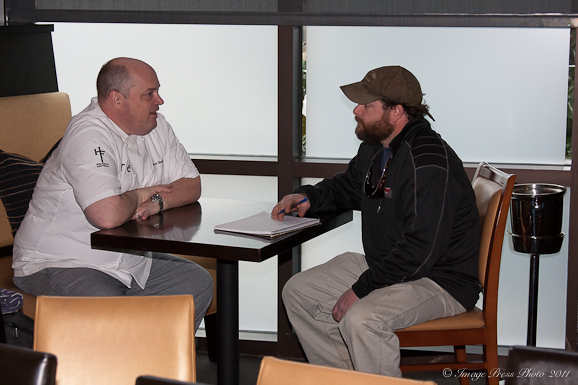 Bravo~ a great interview with Chef Linton Hopkins. When I moved here from California, all my California friends that had moved here before me said, Restaurant Eugene is a MUST. 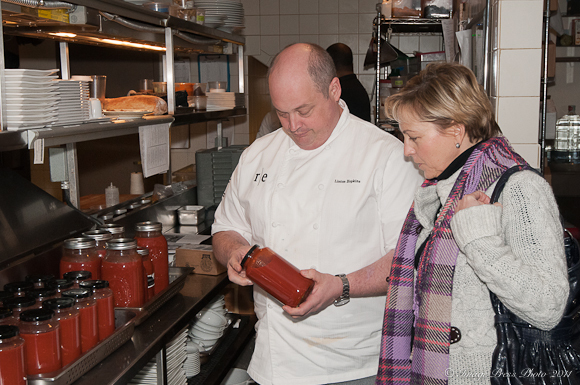 Thank you Chef Linton Hopkins for putting Atlanta on the culinary map!…and thanks for sharing the Shrimp Bisque recipe. Another great interview. You should start taping these! I would LOVE to see a video interview. The bisque looks like a knockout, too. Guinness Stout and Chocolate Cupcakes for St. Patrick’s Day!